Florida's climate has been and continues to be one of its most important assets. It has enabled the growth of many major industries, including tourism and agriculture, which now rank at the top of Florida's diverse economic activities. Our state's climate enables its native ecosystems to flourish and attract citizens from around the world. The dependencies of Florida's society and ecosystems on climate are widely recognized and generally taken for granted. However, we now know that climate around the world is changing. Questions arise about whether or not Florida's climate is changing, how rapidly these changes might occur, and how Florida may adapt to anticipated changes and help mitigate the rates of change. This book provides a thorough review of the current state of research on Florida's climate, including physical climate benchmarks; climate prediction, projection, and attribution; and the impacts of climate and climate change on the people and natural resources of Florida. The editors have gathered more than 90 researchers at universities across the state and beyond to address important topics such as sea level rise, water resources, and how climate affects various sectors, including energy, agriculture, forestry, tourism, and insurance. The volume offers accessible, accurate information for students, policymakers, and the general public. Mesozooplankton, including copepods and krill, play crucial roles in marine ecology, because they serve as links between microscopy primary producers and commercially-important fish species. In this NASA-funded project, the goal is to develop algorithms for estimating zooplankton biomass and grazing dynamics in relation to mesoscale eddy features from remotely observed properties measured by next-generation satellites. The work is a collaborative research project between the University of Maryland Center for Environmental Science and FSU. faceted, explains project co-PI Dr. Mike Stukel, Assistant Professor of Oceanography, FSU Department of Earth, Ocean and Atmospheric Science (EOAS). It will include the development of a stage-specific individual-based model for copepods in the Gulf of Mexico, comparison to in situ zooplankton measurements and satellite observations, and testing of three types of algorithms: empirical algorithms,mechanistic algorithms determined from inversion of growth and grazing equations, and allometric-scaling algorithms." 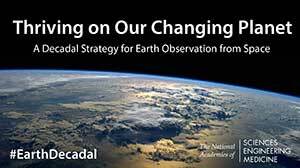 Thriving on Our Changing Planet: A Decadal Survey for Earth Observation from Space. Read more. Note: COAPS is working to contribute to the proposed Earth System Explorer missions -- a competitive program of PI-led missions targeting observables such as atmospheric winds; greenhouse gases; ice elevation; ocean surface winds and currents; ozone and trace gases; snow depth and snow water equivalent; and terrestrial ecosystem structure. Dr. Yangxing Zheng presented a poster on behalf of himself and co-authors, Drs. Mark Bourassa and M.M. Ali, entitled "Distinctive features of surface winds over the Indian Ocean between strong and weak Indian Summer Monsoons: Implications with respect to regional rainfall change in India." 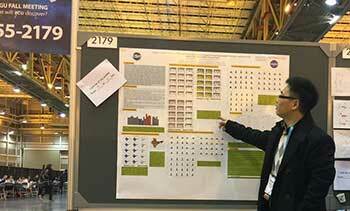 Dr. Zheng was one of several COAPS researchers and students attending this year's American Geophysical Union (AGU) Fall Meeting in New Orleans, LA..
Also presenting at the AGU Fall Meeting was Danielle Groenen, PhD Student, Meteorology, COAPS/ FSU-EOAS whose poster entitled "Diagnosing the Atmospheric/Oceanic Phenomena Associated with the Onset, Demise and Mid-Summer Drought of the Rainy Season in Mesoamerica" was co-authored by Dr. Mark Bourassa. Some 140 third, fourth, and fifth grade students from all over Leon County were at Tallahassee's Math and Science Charter School on Saturday, January 27 to take part in the yearly Math Stars Competition where young math whizzes compete. Organizers said the event primes the students for more advanced competition, as well as helping make their more attractive prospects for college admission. While the kids tackled math problems in the school's 2nd floor classrooms, many anxious parents waited in the cafeteria. Pictured at right: School board member and COAPS Associate Director Dr. Mark Bourassa was on hand, along with COAPS Associate Research Scientist Dr. Xiaobiao Xu. The team manned a weather activities station. Learn more. 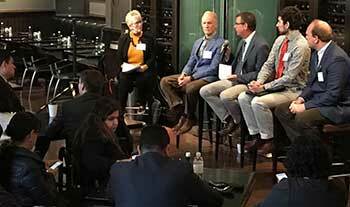 In December, Florida State Climatologist David Zierden participated in a panel discussion organized by the 8th Americas Competitiveness Exchange on Innovation and Entrepreneurship in Leon County. The discussion was part of a six-day tour coordinated by the U.S. Department of Commerce's Economic Development Administration (EDA), in coordination with the Organization of American States (OAS) and the U.S. Department of State. It was designed to showcase cities and counties in Florida with cutting-edge advancement in the areas of innovation and entrepreneurship for representatives from over 27 countries around the world. Learn more. The sixth-annual Tallahassee Science Festival, held in downtown Tallahassee on October 28th drew 5,000+ spectators this year. The event brings together representatives from a wide range of organizations involved with science, technology, engineering, and mathematics, as well as the arts, and they present interactive exhibits. More than130 organizations from Tallahassee and the surrounding region participated, making this iteration of the festival the largest yet. 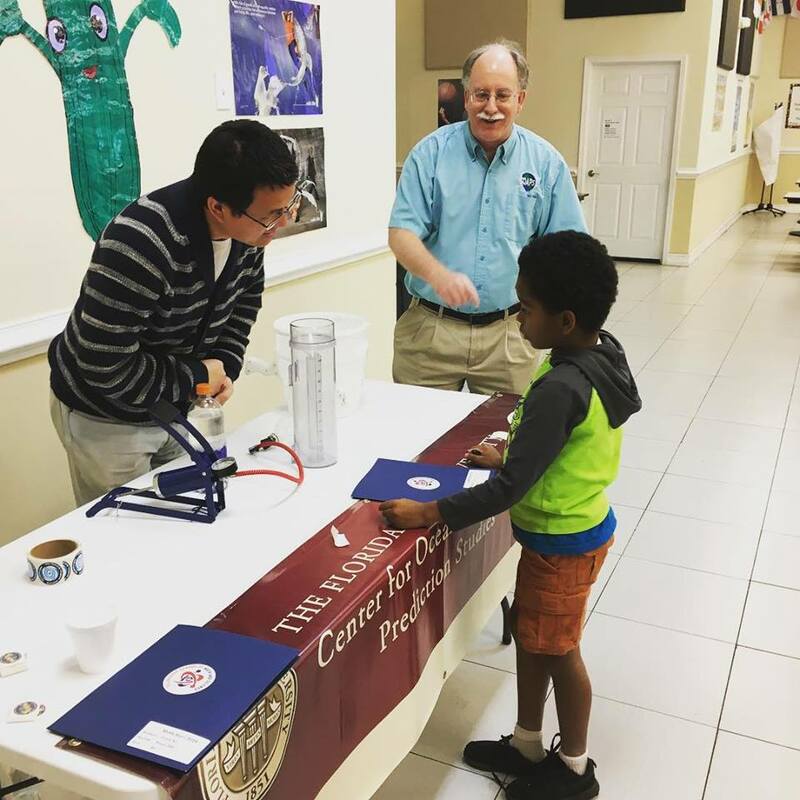 In cooperation with the FSU Thalassic Society, the COAPS exhibit engaged spectators in demonstrations involving making a cloud inside a liter-sized bottle and showing the difference in the densities of salt water and fresh water. A standard rain gauge and hail-collection pad were available for examination, and information was provided about COAPS' wide range of research and service activities. 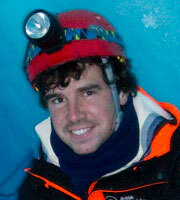 Led by Climate Specialist Danny Brouillette, the outreach team included Drs. Lydia Stefanova and Alan Wallcraft from COAPS, as well as Jason Ducker and Fred Soster from the Thalassic Society. 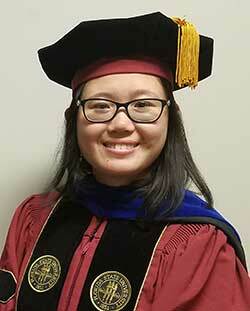 Congratulations to Meteorology students Qi Shi and Jie Sun on their December graduation!. Dr. Shi earned a PhD in Meteorology. Her graduate work focused on analysis of oceanic and atmospheric responses to the current-stress, wave-stress, and wave-current-stress interaction at the Gulf Stream using a high-resolution three-way coupled regional modeling system. Shi's major professor wa s Dr. Mark Bourassa, Professor of Meteorology in the FSU Department of Earth, Ocean and Atmospheric Science (EOAS). Dr. Sun also earned a PhD in Meteorology. He will continue his work on diagnosis of tropical waves and developing a package of tropical waves' diagnosing toolbox for community usage as a postdoc working with his major professor Dr. Zhaohua Wu, EOAS Associate Professor of Meteorology. And kudos to John Steffen (M.S. student, Meteorology) for successfully defending his prospectus: "Barrier Layer Development local to Tropical Cyclones: Argo float observations and COAWST coupled model simulations." 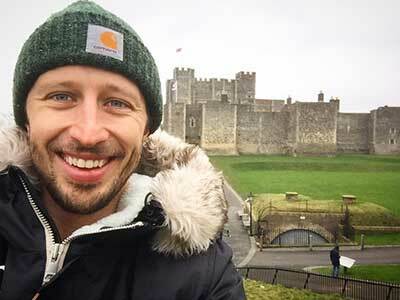 The primary goal of Steffen's research is to investigate coupled air-sea processes between oceanic barrier layer development and tropical cyclone intensity/maintenance. John's major professor is Dr. Mark Bourassa. Austin Todd is now at MeteoGroup in Berlin, Germany. It was former COAPS director and Professor of Oceanography, Dr. Jim O'Brien, who convinced Austin Todd to join the lab as an undergraduate student in Meteorology after taking his climatology course. Dr. Todd initially worked with other COAPS researchers to build statistical models that used drought indexes to predict the intensity of regional forest fires in Florida, before eventually continuing a PhD student in oceanography. Todd worked closely with Dr. Steve Morey to understand the coastal ocean circulation in the northeastern Gulf of Mexico, and the role that physics may play in transporting grouper larvae from offshore into the sea grass beds of the Big Bend. Upon finishing his dissertation at COAPS in 2013, Todd went on to work as a postdoc at NC State in Raleigh with Dr. Ruoying He's Ocean Observing and Modeling Group. There, he helped develop the ocean modelling component of their Coupled Northwest Atlantic Prediction System, took part in deploying and analyzing data from autonomous underwater gliders, and also developed bio-physical models for studying the transport of deep sea organisms. He also had the unique opportunity to participate as a science observer in HOV Alvin, where he was part of the crew that discovered a centuries-old shipwreck off the coast of North Carolina. Since 2015, Dr. Todd has been working in Berlin, Germany as a data scientist -- first at the Telekom Innovation Laboratories and now with Europe's largest private weather forecasting company, MeteoGroup. During his time with Telekom, he worked on a variety of different projects ranging from analyzing autonomous vehicle sensor data, developing prototypes for smart energy distribution grids, and developing automated algorithms for detecting sensor failures. Now with MeteoGroup, Dr. Todd is an evangelist for developing innovative ways to leverage weather data and forecasts into products that can be used across various industries. His biggest accomplishment has been developing a set of machine learning models that determine the number of network faults that energy distribution companies can expect due to adverse weather conditions. His predictions are already being used across the UK to help power companies better prepare for storms. COAPS authors are in bold. Bhardwaj, A., V. Misra, and A. Mishra, A. Wootten, R. Boyles, J.H. Bowden, and A.J. Terando, 2018. Downscaling Future Climate Change Projections over Puerto Rico using a Non-Hydrostatic Atmospheric Model. Climatic Change: An Interdisciplinary, International Journal Devoted to the Description, Causes and Implications of Climatic Change, 1-15. doi: 10.1007/s10584-017-2130-x. Buchanan, S., V. Misra, and Bhardwaj, 2018. Integrated Kinetic Energy of Atlantic Tropical Cyclones in a Global Ocean Surface Wind Analysis. International Journal of Climatology, accepted. doi: 10.1002/joc.5450. Hoffman, R.N., N. Privé, and M. Bourassa, 2017. "Comments on Reanalyses and Observations: What's the Difference?" Bulletin of the American Meteorological Society, 98(11): 2455-2459. Misra V., A. K. Mishra, and A. Bhardwaj. 2018. The simulation of the intraseasonal variations of the Indian Summer monsoon in a regional Coupled Ocean-Atmospheric model. Journal of Climate, (Accepted).